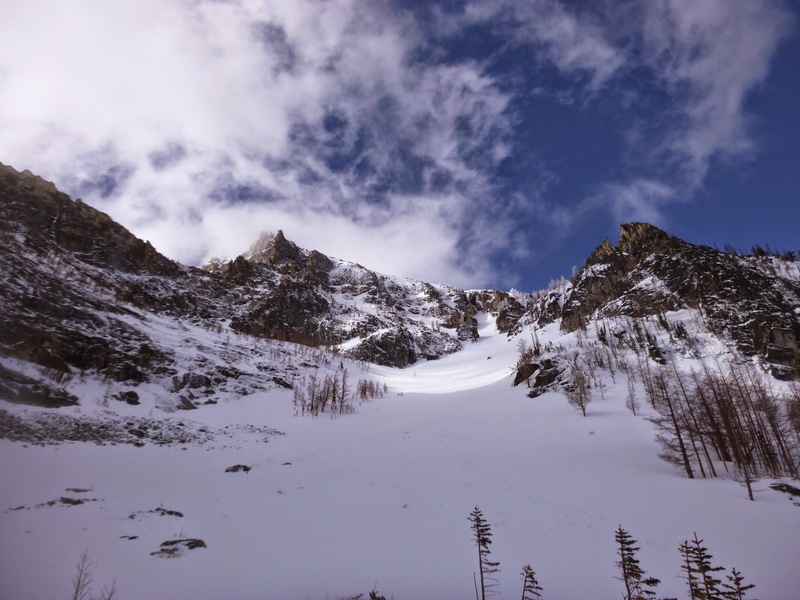 The last few weeks have been somewhat awkward for the mountains of western Montana; the snowpack and the weather just hasn’t been able to make up it’s mind about whether it’s spring or winter. 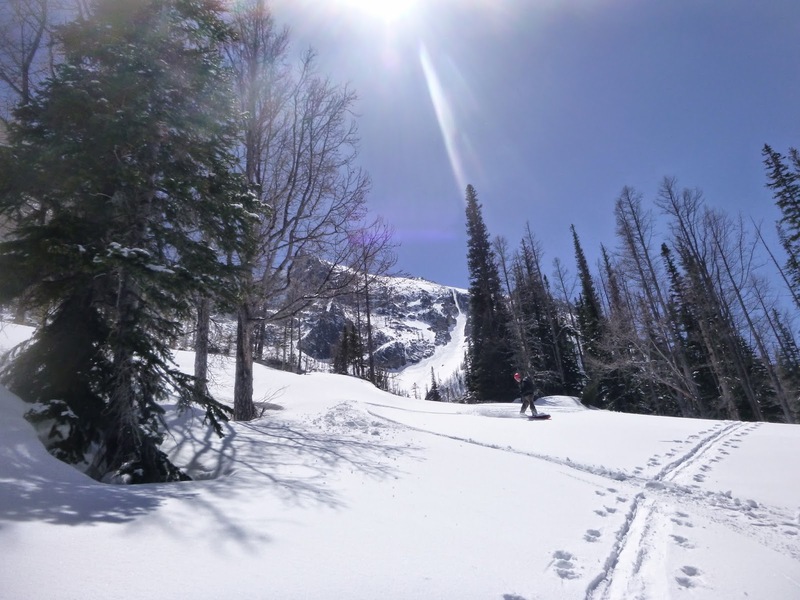 Significant snow accumulations and cool temperatures above 6000′ have been alternating with short lived bouts of unseasonably warm sunny days, producing some generally funny travel and avalanche conditions. Thus, I hadn’t a successful tour in a few weeks until yesterday, instead exchanging touring for getting my running legs back under me. The local hills are blooming with the May wildflowers, with the early ones like Shooting Star and Fringecup now yielding to the ubiquitous Arrowleaf Balsamroot and Lupine (and the lovely Dalmatian Toadflax… a noxious name for a noxious weed). 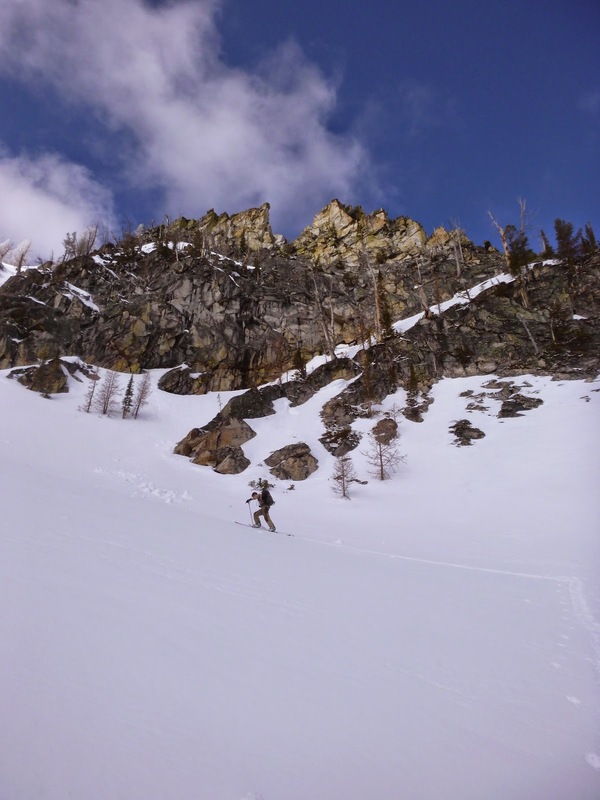 Nonetheless, with a hard freeze predicted for Sunday night, I sacrificed my weekend to work in order that I might take advantage of the fresh snow, refrozen stability, and bluebird conditions for an attempt on a southern Bitterroot classic, Sugarloaf Peak’s north couloir(s). Casey, Chris, and I met at the Pattee Creek Market parking lot at 4:30 for the longish drive to Chaffin Creek at the end of the Bitterroot, during which I solicited Casey’s opinion on whether swimming the Middle Fork of the Flathead in drysuit and PFD would be preferable to lugging a packraft and paddle for this one river crossing during the upcoming Bob Marshall Wilderness Open, in which I intend to participate. I’m thinking of using the drysuit with puffy layers underneath as a bivy system (with the PFD as part of the pad). This weighs about as much as a packraft setup and seems more useful, particularly given that there are no other opportunities to use the packraft on my chosen route. What difficult problems we face here in America. I still haven’t decided. Chaffin Creek turned out to be closer than anticipated, only a bit over an hour, and we were hiking at first light, anxious to make the 5-6 mile approach quickly. The hike was standard, but Chaffin is extraordinary amongst Bitterroot canyons. Good skinning starts around 6000′ right now, and we made it to the base of Sugarloaf in a bit under 3 hours, including a creek crossing. Sugarloaf north aspect. The couloir that accesses the upper face is the sliver on lookers right at the top of the apron. 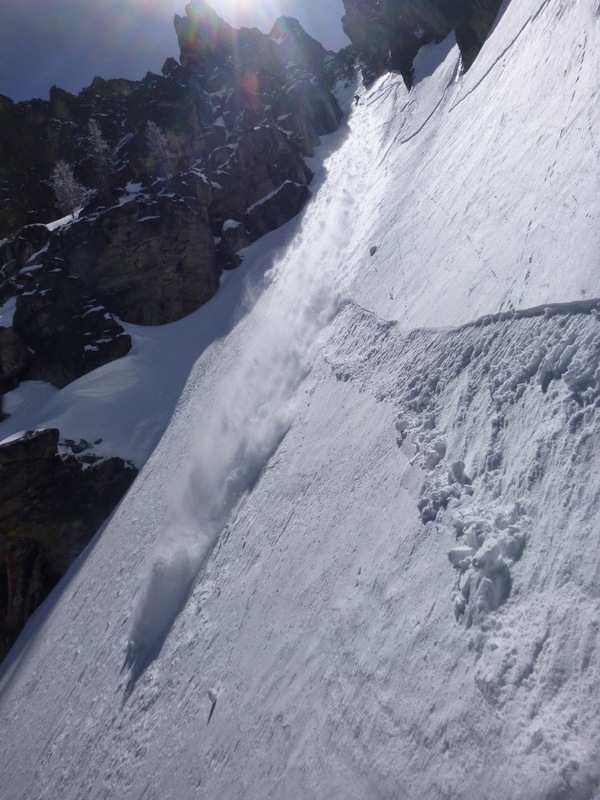 We made quick work steep skinning the apron to the base of Sugarloaf’s north couloir. There was a surprise abundance of fresh, dry, and settled powder. 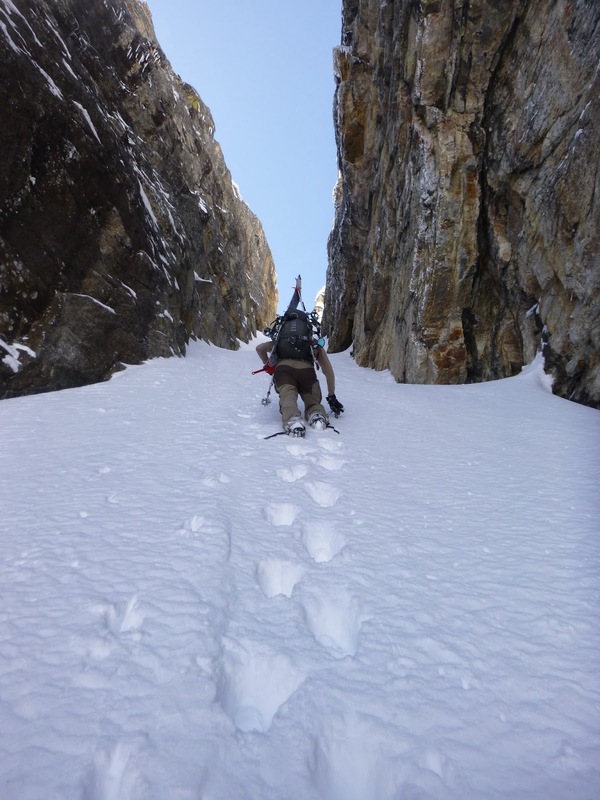 When the going got steep and narrow, we switched to crampons, and securely ascended the 40 degree couloir. I’d been here once before, but was once again enamored with this steep granite defile. The walls are shear and it feels like being in some desert slot canyon (with some obvious differences). The last pitch to access the upper face was steep and icy, and I was glad to have crampons and axe, which allowed us to quad-point this bit easily. 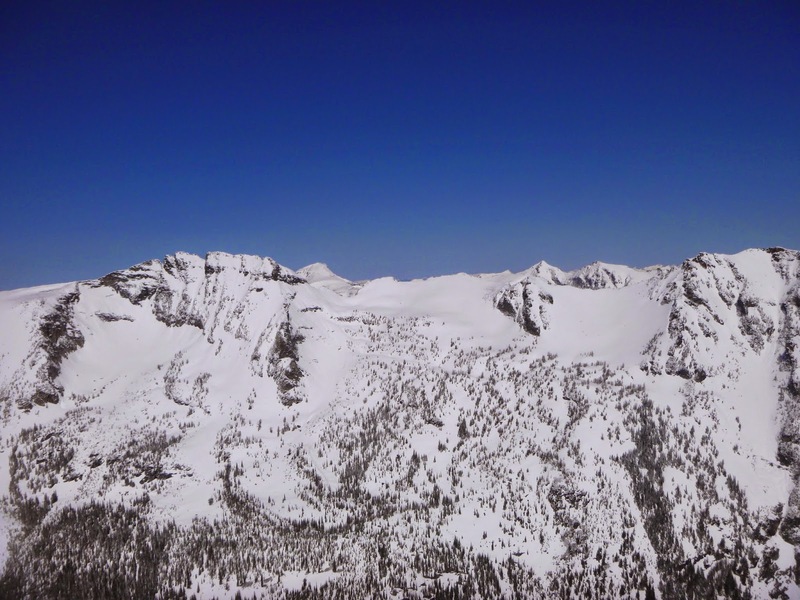 The cornices overhanging the couloir made me glad that we had gotten an early start on this warm day. The north face, like many such faces in the Bitterroot, is exposed to transversely oriented westerlies that tend to strip the face down to talus or shallow and slabby snow. As such, we left the planks at the top of the couloir and walked towards the summit, keenly aware of the exposure on this hanging face, which is just steep enough to command attention. The final pitch to the rocky true summit was more than I felt inclined to tackle, but Casey and Chris made the trip, which was a good photo opportunity for me. The summit of Sugarloaf Peak. The south face of the Shard (left) and Tin Cup Peak (right). The south face of the Shard is as epic as anything I’ve seen in the Bitterroots, and seems as though it would be a ski mountaineering objective on par with the east faces of El Cap or Sky Pilot. 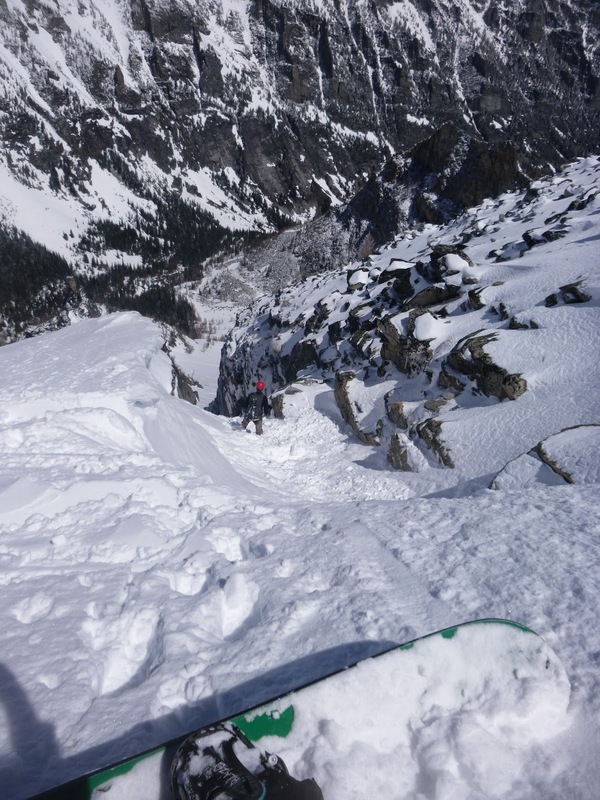 With the summit bid complete, we skied back down the couloir in good style and major sluff. The fresh snow, though not slabby, was deep and inclined to move. 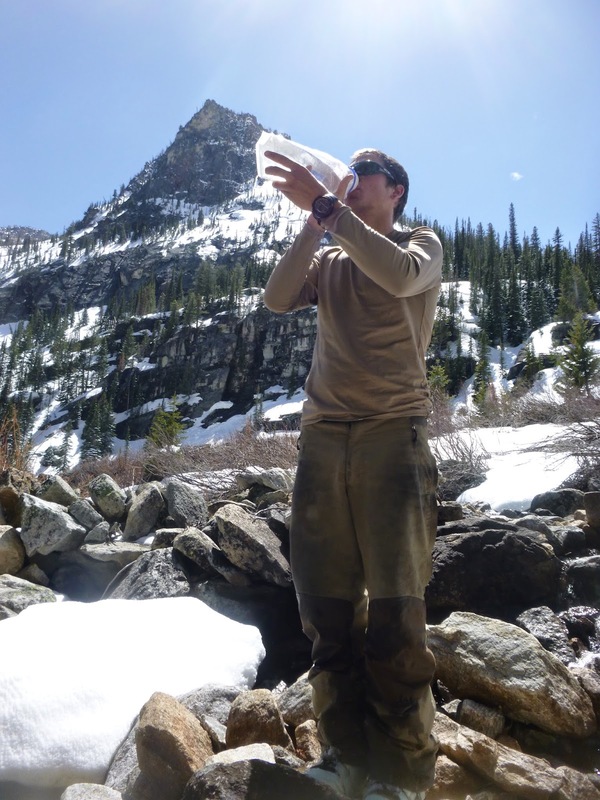 It was fun managing these big streams of snow atop a bomber snow pack lower in the column. At the bottom of the couloir, we concluded that another run was in order, and we booted another somewhat hidden couloir further to the east on Sugarloaf’s craggy north face. 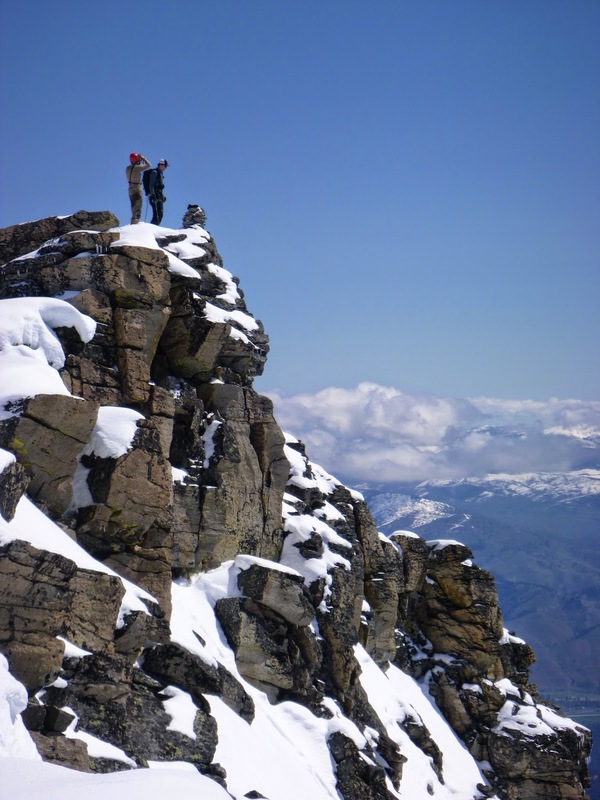 This route steepens to 45 or more degrees before pinching into an alpine climbing affair that may very well offer an alternative and challenging route to attain Sugarloaf’s summit. We stopped where the skiing did, and skied this thousand foot line back to the apron, again producing vigorous and entertaining sluffs. 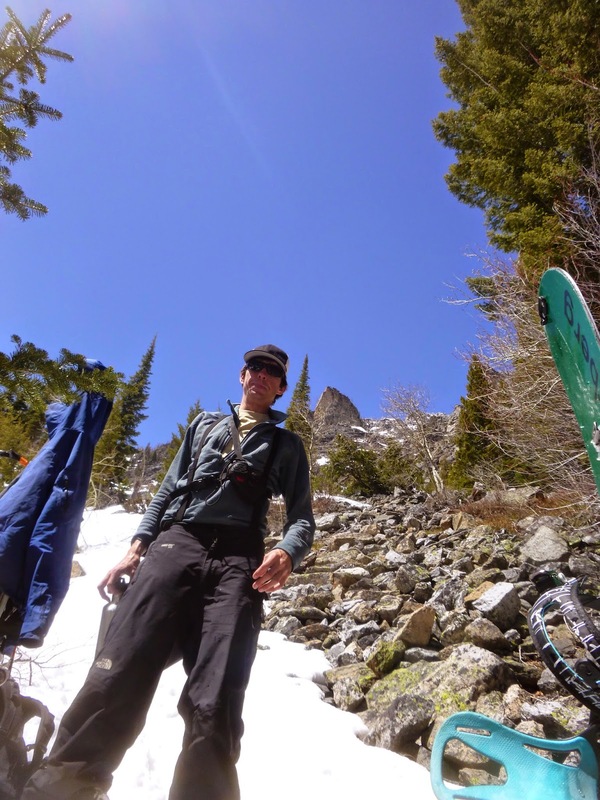 Sluff management in Sugarloaf’s hidden couloir. The day had turned warm so we pointed skis towards home. The apron back to the creek served up another thousand or so of good quality chalk (though riddled with wet slide ice bombs) back to the Chaffin creek-bottom, where we refilled water and refuelled for the hot and soggy egress. 14 miles and 6000′, done in 11 hours car to car. Previous PostHalf Daze of Glory.Next PostHarvest Time. You should ask Dave's option on the packraft vs drysuit delema. He's been on all those rivers at all kinds of flows. Id personally ideally go with a lightweight packraft. Like a scout, or something similar. The things is, is that I own a drysuit and not a packraft. Know anyone who would loan me one? Care to join? Sorry, Doug. No dice. Everyone's boat is spoken for during the coming weekend. Have fun out there.